The vast majority of Americans have little or no savings outside their retirement accounts, according to the latest Federal Reserve Survey of Consumer Finances. If that describes you, and you haven’t built a solid financial foundation to help you weather the challenges life invariably throws you, you’re taking an enormous gamble. Without significant safe and liquid cash reserves, how will you cope with a medical emergency… disability… broken major appliance… loss of a job… or a family member needing assistance? A Lack of Cash Reserves is a Recipe for Financial Stress and INsecurity! Like much of the conventional financial “wisdom,” the standard advice of having a rainy-day fund equal to three to six months of household expenses won’t cut it. In the last recession, millions who lost their jobs remained unemployed for over a year, or even two. To have real financial security, you must have safe and liquid cash reserves equal to two years of household income. There are a couple things you can be sure of: Bull markets come to an end, and the crash and recovery can be long and painful. Investing is what you do only with money you can afford to lose – because you very well might lose it! And in life, you can always expect the unexpected. Whether it’s a critical emergency that hits or a positive opportunity that comes your way, you want to be ready for anything life has in store. 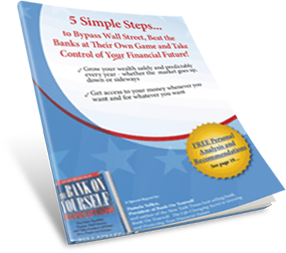 To find out how the Bank On Yourself safe wealth-building method can reduce your financial stress and give you financial peace of mind for life, request a free Analysis. You’ll get a referral to one of only 200 advisors who have met the rigorous training and requirements to be an Authorized Advisor. They can answer your questions and show you ways to free up money to fund your plan – sometimes without reducing your cash flow or lifestyle at all.